During January-February 2010, The Bleyzer Foundation (TBF) completed our first survey of the investment community in Ukraine. The results are summarized in the table below. 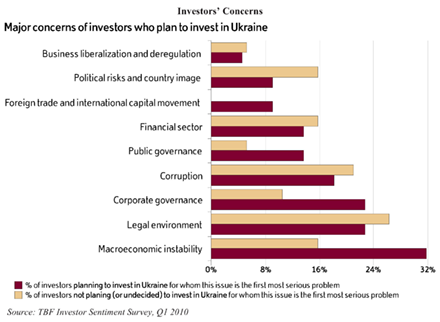 Overall, more than half of all respondents plan to increase investments in Ukraine within the next six months. At the same time, many investors are still cautious to make any investment. Meanwhile, a slightly larger share of investors (61%) intends to invest in other countries within the next six months. 20% of all respondents prefer to invest in Ukraine than in other countries (these respondents plan to increase investments in Ukraine within the next six months, while they are not planning to or are undecided about investing in other countries). Meanwhile, 28% of all respondents prefer to invest in other countries than in Ukraine. And 20% of all respondents are not going to invest at all within the next six months or are still undecided. Slightly less than half of all respondents plan to increase the number of jobs in their Ukrainian companies and only 2.4% of respondents plan to cut jobs, while over half of all respondents intend to keep employment stable within the next 6 months. To construct our Investor Sentiment Index, we assigned 200 points to positive responses (yes/increase), 100 points to neutral responses (undecided/stay the same), and 0 points to negative responses (no/decrease). 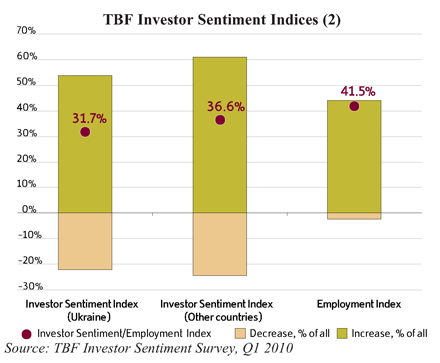 The Investor Sentiment/Employment Indices are calculated as an average of all points. The main index - the Investor Sentiment Index - is calculated as the average of three indices and measures overall investor sentiment in Ukraine. The higher the value of this index, the more optimistic investors are about future economic and business prospects. All indices are located close to the area indicating strong willingness to invest. This means that investors in general tend to have favorable sentiments about Ukraine’s economic prospects as well as the outlook for other countries. In addition, companies are planning to hire more employees in Ukraine, which may imply that they expect their business to grow within the next 6 months. An alternative approach is to use the difference between the shares of positive and negative responses to track investor sentiment. It shows that, on the balance, over a third of investors are willing to invest over the next 6 months. Our survey asked investors to rank 9 factors affecting their investment decisions, with a rank from 1 (the major concern) to 9 (the minor concern). The impact of each factor was calculated as a weighted sum of its rank and a corresponding weight was assigned to each rank (rank 1 weighs 9 points, rank 2 weigh 8 points and so on). Finally, we added all weights assigned to each factor and we ranked each factor according to this aggregate value: from 1 (the highest value and of the most concern) to 9 (the smallest value and of the least concern). According to this methodology, macroeconomic instability, unpredictable legal environment, and unsatisfactory health of the financial system are of major concern to investors. For 54% of interviewed investors, these factors are the most important obstacles to investment. 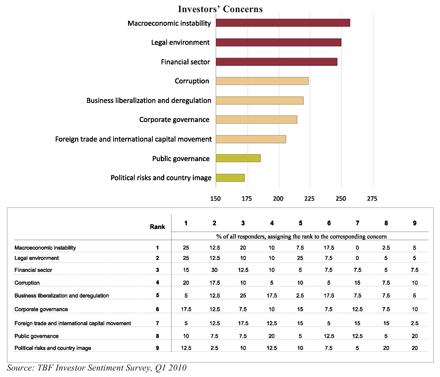 At the same time, corruption, insufficient business deregulation, weakness of corporate governance, as well as insufficient foreign trade liberalization are also serious impediments for investment – nearly 42% of all respondents named these factors as their major concerns. And finally, public governance and political risks appeared to be the most serious concerns for only 25% of all respondents. Lastly, investors who expressed their intention to invest in Ukraine within the next six months appeared to be mostly concerned with macroeconomic instability, the legal environment, corporate governance, and corruption. At the same time, they are less worried about business liberalization and deregulation, political risks and country image, liberalization of foreign trade and international capital movement. Meanwhile, investors who are not going to invest in Ukraine or who are undecided named the legal environment, corruption, the health of the financial sector and political risks as the main impediments for investment. These investors are less worried about business liberalization and deregulation, public governance, and corporate governance. 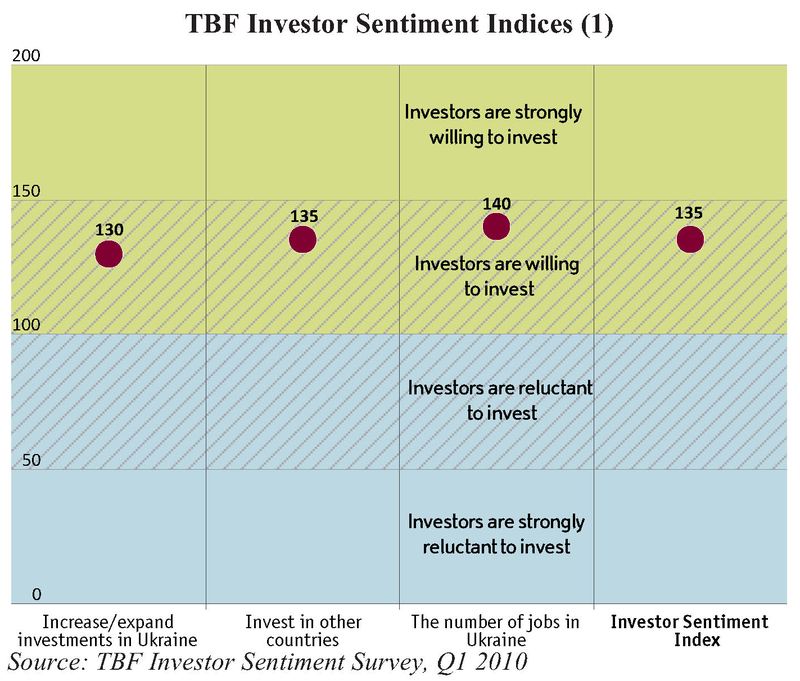 FOOTNOTE: The entire TBF Investor Sentiment Survey Q1 2010 can be found in the attachment to this e-mail. 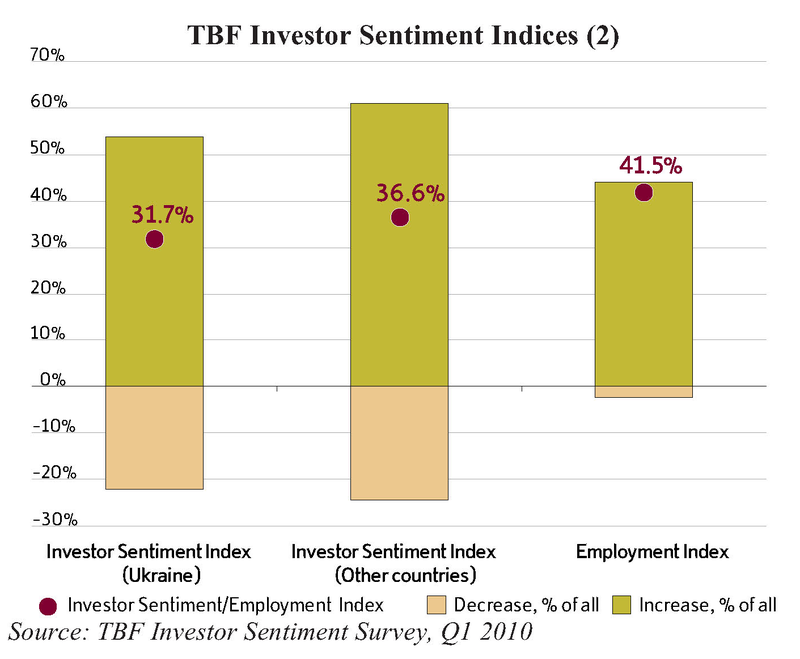 This is The Bleyzer Foundation's (TBF) first survey of the investment community in Ukraine. 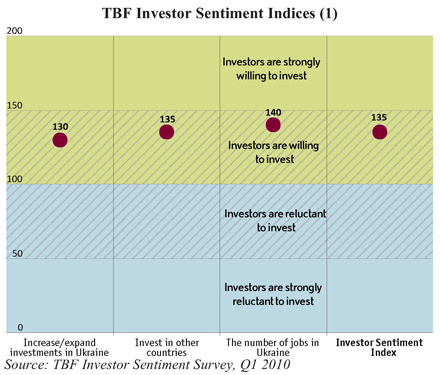 The TBF Investor Sentiment Survey will now be published quarterly. CONTACT: Oleg Ustenko, Executive Director, The Bleyzer Foundation (TBF), 4A, Baseyna Street, "Mandarin Plaza", 8th floor, Kyiv 01004, Ukraine. Tel: +38 (044) 2841289 Fax: +38 (044) 2841283, E-mail: info@bleyzerfoundation.com, www.BleyzerFoundation.org. USUBC NOTE: The Bleyzer Foundation (TBF), Kyiv, Ukraine, is a member of the U.S.-Ukraine Business Council (USUBC), Washington, D.C., www.usubc.org.